The program combines rotational core training with isometric movements to build a long lean torso, and elevates the heart rate to torch fat with Wave Runners, Shark Kicks, Duck Dives and of course the signature surf move.. the Pop-up. All of the exercises are beach inspired & total-body, and include strength, cardio and flexibility based movements. 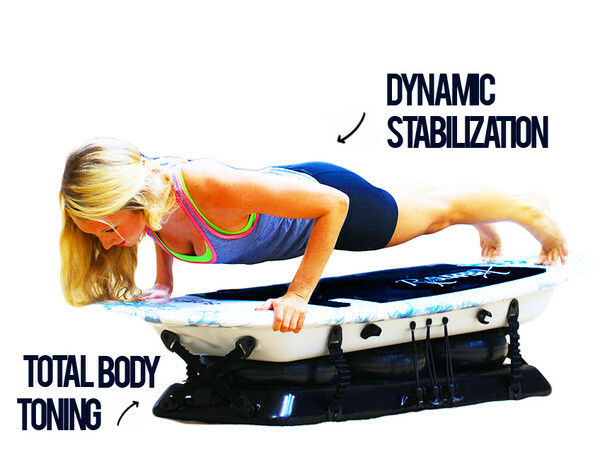 The instability of the SURFSET® board improves athleticism by constantly causing core muscles to react to a dynamically shifting platform. A single SURFSET® session can burn anywhere from 500-900 calories in just 45 minutes.. the same results you would get from a few hours of surfing. THE TRADITIONAL IMAGE OF A SURFER’S BODY IS LEAN AND LONG-LIMBED, WITH TIGHT, WELL-DEFINED MUSCLES AND VERY LITTLE BODY FAT. A surfer is lean without looking weak, and muscular without the bulk. Sharp muscle lines are perfectly symmetrical, and overall body balance creates that enviable athletic physique. Paddling builds shoulder definition, strengthens the lower back muscles, and increases cardiovascular fitness. Duck-diving through waves builds arm strength: tricep strength in particular. The pop-up maneuver engages the core and pectoral muscles, and helps to build explosive power. And the actual process of standing and riding the wave increases leg strength, flexibility, and engages all the postural muscles. To learn more checkout SURFSET’s website. Surfers are the perfect picture of long & lean. SURFSET® promotes compound & functional movements that challenge all the tiny little stabilizers in your body along with the major muscle groups to shape toned & strong limbs and rev up your metabolism. We promise you’ll start seeing & feeling results in less than a week. 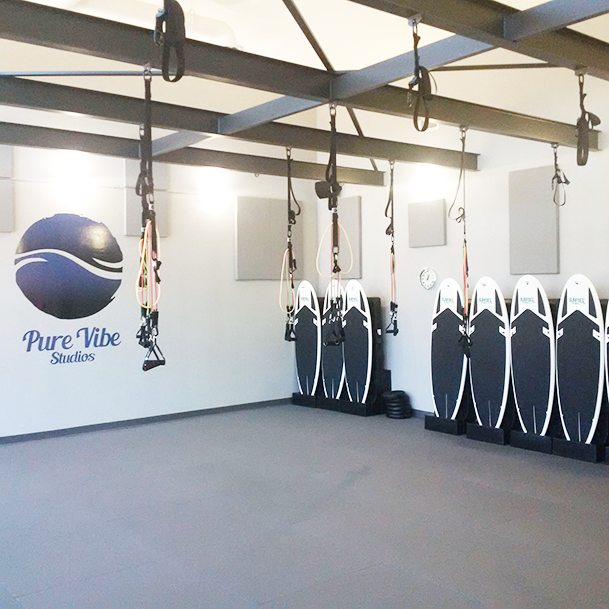 SURFSET Balance focuses on breathing, flexibility, core strength & body control. This is the ‘beginner’ level although it can be very challenging if all moves are executed properly. This is a great intro program to get used to the motion of the board & begin to develop the mind/body connections necessary for other SURFSET programs. Balance is also an awesome way for Yoga enthusiast to elevate their practice to the next level by introducing an unstable surface. SURFSET Blend -This is the all-inclusive SURFSET Program that incorporates equal amounts strength training, aerobic & sprint training, core strengthening, balance improvement & surf-inspired exercises for a fast-paced, results-oriented, fun session. SURFSET Build session is focused primarily on strength training, while of course engaging the core. We use other implements beyond just the board, and also integrate a lot of total-body compound body weight exercises. The session is divided into 4 segments, designed to deliver a balanced & well built athletic physique. SURFSET BURN – The Burn Program is focused on building aerobic capacity, burning fat & pushing pas plateaus with quick, high-intensity sprints. We also get a total-body toning session as all moves require us to recruit muscles throughout the upper & lower body and the core. Junior SURFSET – Our Junior SurfSet Fitness program emphasizes super fun simulated surf sessions on SURFSET’S RipSurfer X. Our Junior surf sessions not only entertain and stimulate kids, they provide a fun way to get and stay fit through surf adventures right here in Lloydminster! Also, inquire about birthday party packages!!! Open to children ages 7 through 13.